<!-black-> It is a delight to share with you some of the missionary bottle letters that my ministry received from various parts of the world in the 1980's. Each one of the Lord's missionary bottles floated far away and delivered the precious Word of God to one individual at a time. Many, many of these are still floating and will yet deliver God's precious Word of God to a spiritually hungry individual somewhere in this world when the time and opportunity is just right. I originally printed some of these letters in a small testimony booklet titled Current Miracles. It was written and copyrighted in 1984. My ministry at that time was named "Current Evangelism Ministries" so I thought the title was appropriate. It was written by me. I now quote it here for the glory of God and for your encouragement! <!-black-> "Floating messages in bottles is not a new invention of mine. I suppose people have been doing this for hundreds- perhaps thousands- of years. Many times I have walked along beautiful ocean beaches and wished I could find an ancient bottle containing an old original pirate treasure map or something. There is a certain mystique in finding a message inside of a bottle. <!-black-> And many times I have stood on the seashore looking out over the vast expanse of the ocean, the love of Christ beating strong within my heart, having a strong desire to tell others about Jesus. This desire was burning in my inner being. I wanted to reach out to the people living on the other side of the ocean. I could "feel them" within my grasp and I could sense some kind of unusual expectation in this regard pertaining to the will of God for my life. <!-black-> I often wondered if there were people "out there somewhere" who needed to be told about Jesus Christ- how He came as God to this earth, how He showed such great love, how He died on the cross to set them free from their sins, and how he resurrected from the tomb and is alive forevermore. I just had to know. Was there a need and hunger for the Word of God among people on continents on the other side of the world? The North Equatorial Current flowed directly to them in the Pacific Ocean from off the coast of North America. If there were people who needed the Word of God I wondered who they were and what their needs were. and then that person would pray and invite Jesus Christ to come and live in his heart and become gloriously converted. <!-black-> The physical method theory seemed scientific and plausible: place each bottle in the current, wait for God to pilot it to a person, wait a little while longer for a bottle finder to write us, ascertain the needs, and help that person as much as possible. And it worked just that way. <!-black-> I did not know what to place inside every bottle. (At the time I did not know anything about the other missionary bottle evangelists or their ministries). Personal notes were nice but that idea did not satisfy me. Bible study sign up cards was another idea that seemed okay but there seemed to be something lacking with that idea. The Holy Spirit working through His Word for the conversion of the lost was the answer. I knew I had to place the Word of God in every bottle. 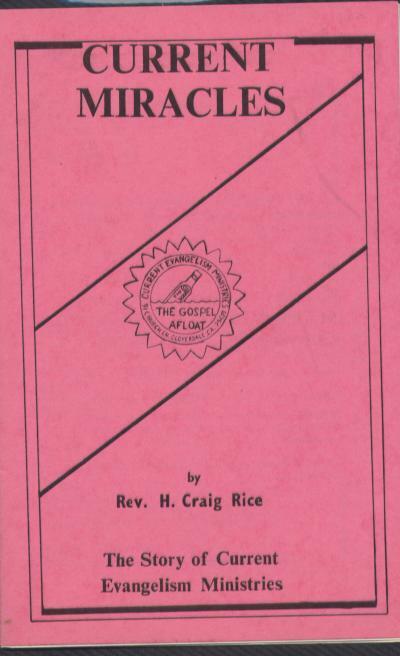 Gospel portions proved to be the perfect evangelistic tool to use. In addition to a gospel portion inside each bottle, gospel tracts and outdated Sunday School literature was also used. <!-black-> Experimentation was made with all types and shapes of bottles, glass and plastic. The majority of Missionary Bottles that have already floated were (16 ounce and under) glass bottles that were tightly corked. These worked very well. <!-black-> The idea of the Missionary Bottle is very basic and I am surprised that others to any large extent have not discovered the simple concept involved. Please let me share with you. Draw in your mind two circles. The right circle represents the U.S.A. and the left circle represents many nations on the other side of the world. The right circle has an abundance of gospels and the left one has a shortage of gospels. The right circle has the greatest abundance of all the wealth in the world for a small population and the left circle has the opposite. In other words, if you please, we have the bread and they have the crumbs. The arrow represents the Pacific Ocean's North Equatorial or Japanese Current. The current flows from the U.S.A. to Asia and other continents. Missionary Bottles placed in this current will go where the current goes-to Asia and other continents. Does it matter precisely where the Missionary Bottles go? Not really, because with half the population of the world living in Asia and in nations touched by ocean currents, each Missionary Bottle will find a need and fill it. And people living on remote islands untouched by a missionary or blessed with a church will have an opportunity to receive the Word of God. <!-black-> What an opportunity is at hand for dedicated Christians to give the gospel to so many by such simple means. Our first Missionary Bottles floated in 1967. But the active ministry was decreased temporarily while I earned a Bachelor of Science degree in Bible from Bethany Bible College (now named Bethany University) (Assemblies of God) in Santa Cruz, California in 1972. Some time after graduation I gathered about me several committed individuals who believed in saving souls and who believed that Missionary Bottle evangelization would work. Each of these individuals helped me tremendously. <!-black-> In the fall of 1978 the first large boat load of over 12,000 Missionary Bottles were launched in the Pacific Ocean. Approximately 18 months later we began receiving replies from individuals who had each found a Missionary Bottle on the other side of the world from us. Over 100 letters from that many individuals wrote us. Replies came from the Philippines, Indonesia, Malaysia, Papua New Guinea, Canada, and Mexico; also from the Pacific islands of Truk, Nukufeta, and the Solomon Islands. We guessed that many Missionary Bottles landed in Communist nations such as Russia, China, North Korea, and North Vietnam but we received no letters to prove our theory because all mail in most Communist countries as far as we know is censored. <!-black-> Two significant letters came from the same minister on Dinagat Island in the southern part of the Philippines. Here is what his first letter contained: "To whom it may concern. Greetings to you in Christ Jesus. I want to give my thanks to our fellow ministers there in the states-for God used you to evangelize the people along the coast. Your ministry gives us more victory here in my place. One fisherman found a bottle of miracles last May 9, 1980. It gives us more encouragement-to work with Him, our Creator. The men gave their testimonies how God saved their lives and their families through this ministry. And the whole town was shaken and feared God. Because of this miraculous happening our church increases daily and the more people worship the Lord and glorify His wonderful Name. So lastly pray for us for more success. Kindly answer us back after you receive this letter to prove to us that your organization is still alive together with Christ. The booklet inside the bottle was the Gospel of Luke, the Light. Thanks. Rev. Julieto E."
"Greetings to you in Christ Jesus. It is truly wonderful and sweet while we are awaiting His coming. I received your letter last July 18, 1980, telling us how wonderful God is. And how big and wide your ministry is through Missionary Bottle evangelism on the ocean. And thanks so much for your helps in literature and Bibles. Our church rejoiced at how God answered. <!-black-> For five years we prayed for more Bibles for the people who really needed them. Our island needs hundreds of scriptures because for so many years the people here have been brainwashed with false cult doctrines, but mostly here they worshipped idols, trees, and mountains. <!-black-> But, praise the Lord, since the bottle from Bread On The Waters landed on our island, our people began searching for the truth and received the Lord Jesus Christ as their personal saviour. We baptized seventy souls in a ministry lasting two and one half months with testimonies from them of how God sent a miracle bottle here to my island. Night and day services in different places on the island resulted in God performing His power to save the lost in connection with your lovely gift from your ministry to us. <!-black-> Our people here are not very well educated. Our island is very farm from the mainland of Mindinao by several hours boat ride. Because of this reason I am requesting to you and your ministry to give us Cebuano dialect Bibles- we need twenty dozen of them. <!-black-> Lastly, thanks so much for your great concern for our work here." <!-black-> Bread On the Waters purchased from the American Bible Society 240 Cebuano dialect New Testaments (the complete Bibles were not available in the USA) and sent them by sea mail to Rev. Julieto E. He distributed them to the new converts plus to his own church congregation and then took a group photograph (each person holding their New Testament we sent) and mailed the photograph to us. We were thrilled and so delighted to help them in the Lord. <!-black-> A man with leprosy in the sanitarium on the island of Palawan in the Philippines wrote us and said he needed clothing for his wife and children. He said that since he had leprosy he could no longer work and wanted us to help him and his family. To meet this need we put the call out to all our friends and many of you were so generous to provide the need. We soon had boxes of clothing mailed to his large family and then we sent extra boxes of clothing also to the man in the sanitarium with instructions to him to distribute the extra among the other patients. The man wrote us and said all the boxes of clothing had arrived. He said he had distributed the extra clothing among the patients in the sanitarium and also that his children had jumped up in the air for joy at the arrival of the clothing for them. They were all happy and so appreciative. My wife and I smiled at the thought of so many Filipino men running around the sanitarium dressed in my extra U.S. Navy "skivvy shorts" we had included in the shipment. Some were red, white, and blue! <!-black-> The Philippines and most countries where the Missionary Bottles have landed have no public assistance program. If individuals do not receive help then they do without and if the deprivation is severe enough it could be terminal. God help each of us to always have compassion on the poor. Christ did. The letters that arrived from other parts of the world indicated there were many needs to be met. We were able to determine that the majority of born again Christians in foreign countries of the world cannot afford to buy a Bible or New Testament. In many Asian nations Bibles cost three times more than they do in the U.S.A. Many born again Christians do not have enough to eat, proper nutrition, medical care, or decent clothes to wear. One eighty-year-old Christian gentleman living in the Philippines found a Missionary Bottle and wrote to us. He said he had never been able to buy a Bible in his entire lifetime due to a shortage of finances and was very thrilled when we mailed him one in large print. Soon after he went to be with the Lord. Ecclesiastes 11:1: "Cast your BREAD ON THE WATERS..."
<!-black-> Several ideas came to us in relation to our Missionary Bottles. A Missionary Bottle can go where many of us cannot go and do what many of us cannot do. The Word of God in a bottle can continue to exist until long after many of us are gone. It has the capability to keep preaching long after many of us have become silent. The Missionary Bottle can transport the Word of God to nearly anyone at anytime who lives on any island or along any coast land in the world. It can transport the Word of God behind communist doors and go under the iron, bamboo, and Moslem "curtains." It can take the precious Word of God to any beach (where the missionary bottle can be discovered) in Russia, China, North Korea, Vietnam, Cambodia, and more. <!-black-> A Missionary Bottle can become a time capsule keeping the Word of God safe and secure on the ocean waves in case a godless world government should be instituted, outlaw the Word of God, burn all the Bibles and persecute the saints. The Bible indicates all this will happen after the rapture of the Church. In those days in the future the Word of God will be worth its weight in gold anywhere in the world. And every Missionary Bottle is in the hands of God to be piloted to anyone anywhere at any time. A Missionary Bottle has a maximum floating length of approximately one hundred years so when one is discovered in those days, it can be taken to an underground printer who can then make and distribute more copies of it. Revival can break out anywhere at any time. God has always beaten Satan to the punch. <!-black-> The gospel literature inside each Missionary Bottle is written in the English language. English is nearly the universal secondary language of the world. It is taught to school age children in nearly every nation of the world including Red China. I was told that a Bible is worth a year's wages in Russia (in the year 1980) so a gospel booklet is considered very valuable after it is found inside a missionary bottle on a Russian beach. We believe God will always send along someone to help translate the gospel booklet into the local dialect. Some translators need to be saved also! Soon after each Missionary Bottle is set adrift it becomes covered with barnacles which protect it when it drifts ashore on the other side of the world. "Dear Friends: Here is something that will no doubt greatly bless your hearts. Our Filipino tribal missionary, brother Salvador L., in the Polillo Islands (East of Luzon) sent this story in to our Manila office. It was written in the Tagalog dialect and translated by my secretary in Manila. (We are also putting you folk on our mailing list so that you can keep up with our work in the Philippines, and pray for brother L. and the work among that Dumagat tribe) These are Dumagat tribe's people who came to Jesus through this fantastic bottle that landed in the coral reefs of Polillo. About the time the bottle was sent out on the tides, we planted brother L. there for the express purpose of the evangelization of those Dumagats! Cast your Bread On The Waters for thou shalt find it after many days. Yours for missions, Ernie Reb." "Dear Rev. Ernest A. Reb, Greetings in the name of Jesus Christ our Lord and loving savior. I am writing this letter to report our work here in Burdeos. Our weekly services in the chapel in Burdeos continues, as we minister to the tribes and to the non-tribes. Every second Sunday we have our services in Barrio Caniwan, and this is a regular outstation work. <!-black-> We are praising the Lord for working some miracles among the tribespeople. A tribeswoman, by the name of Lilla Armada, gave birth to twins, one boy and one girl. The boy was born first and alive, but the girl was dead when she came out. For 15 minutes she was dead, but after we prayed for her in the name of Jesus, she became alive! Oh, praise the Lord! The tribespeople are a witness to the miracle working power of a living God! <!-black-> The second miracle happened on March 15, 1981, after our church service. We were visiting in the house of a brother and praying for a sick child. After our prayer, a man approached me and showed me a little book, which turned out to be the Gospel of John. This man came from a far place in the western part of the island of Polillo. He walked about 35 kilometers in the mountains just to see me and show me this book that he said he found on the beach while he was there with his wife and a child of three years old. When I opened the book, I saw two pieces of literature (tracts) which the man said were wrapped around the book when he found it. He told me he found the book on the beach by the Pacific Ocean. He said the book was inside a thick bottle that was tightly corked and which was almost covered with barnacles. It was dated August 11, 1978, so that means the book had been in the seas for almost three years. The address from the bottle revealed that the book came from California. After giving me the book, the man asked me what it was all about, and I willingly explained it out to him. He was weeping with joy as he accepted the Lord after listening to my explanation, together with his family who accepted Christ. Oh, praise the Lord for opportunities and times like these. God, perhaps, had been beckoning these people to come to Him. This man absolutely knew nothing about Christ because he did not know what the book was all about. He had never heard the gospel where he lived. There was no Christian worker in his place so they walked several kilometers just to see me. In fact, he did not even know me, or he was not even sure if he could find me, but he came anyway, so I am sure, Brother Reb, that it was God who called them and brought them to me. He is Lorenzo Aquino, married and with one child. Brother Reb, I want you to take special notice of this man because throughout the years of my ministry this is my first time to witness this kind of calling from God to get this man saved. I also suggest that you contact the sender of the literature that Lorenzo Aquino found, who had been instrumental for his salvation and that of his whole family. Praise God! Until here, Respectfully Yours in Christ, S.L." <!-black-> We are coordinating with International Correspondence Institute (ICI) so each person living in a free country who finds a Missionary Bottle and writes us will receive a free Bible learning course sent to them free in their own language dialect to strengthen them in the Word of God. We also encourage every finder to send us a list of names and addresses of people who live in their area so they too can receive a free ICI course. We send Bibles free to all new converts who send us lists of names and addresses. <!-black-> There are hundreds of thousands of islands scattered throughout the Pacific Ocean. There are millions of people living on these islands. Multitudes of these have never heard of Jesus Christ, have no missionary or church on their island, and do not receive gospel radio or television. God has been reaching these remote isolated people He loves with the Gospel by piloting a Missionary Bottle directly to them. We have testimonies of God doing this. <!-black-> The Gospels we place in the Missionary Bottles are in the English language. However, we do use salvation literature in the following languages: Vietnamese, Russian, Simplified Chinese, Japanese, Korean, and Indonesian. "Dear Sender, I was very fortunate to find a bottle on my way to the barrio (village) while I was going home for a week's vacation. Inside the bottle was a little book in English with the title, The Water-the Gospel of John. Your address was also inside the bottle. It was in the afternoon on February 20, 1981, when the bottle drifted ashore and it also happened that I was passing on that rocky path when I picked up the bottle. I was very lucky to be like that because many people passed by on the path but nobody was able to see the bottle but me. Very truly yours, Nolasco G."
<!-black-> "Dear Sir, I'm sure you will be surprised why I send this letter to you. Let me tell you why I'm writing you. It was early in the morning when I went to the sea to gather seashells. I was busy gathering them when I saw something black floating to and fro as it was carried by the waves. Then I put down my basket and picked it up. To my surprise it was a bottle covered with black moss. I became curious, so I opened it. I found something inside. It was a booklet, a Gospel of Saint John. It was floated in 1978. I found the bottle on January 3, 1981. I took it home and showed it to my mother. I enjoyed reading the booklet. I read it several times. My mother is keeping it. Many neighbors tried to borrow it, but my mother did not want to lend it to them. Respectfully Yours, Oscar D."
<!-black-> "Rev. Kraig Rice, Thank you for answering my letter. I received it last month in July. And here are the names of people who live in our area and I hope that through your free Bible lessons they will be strengthened in their faith. About the literature that you have been asking about- the names and title I do not know because as I said in my first letter I'm not the one who personally found the bottle. It was the fisherman who is now an active member of my church. According to him all the literature was passed to other people until it was lost forever but the daughter of the fisherman had kept a copy of the address. And according to him the bottle was found in 1980. When I visited them to witness to them, they told me about the bottle he had found. I was very inquisitive about these matters so they presented to me the address. Thank God because through your ministry there are many souls brought to Jesus' feet. Praise the Lord, they are now active in serving the Lord even in spite of the hardships of life and in the midst of crisis. That is why, brother, I am sending you a letter just to let you know about the works here in our place. Yours in His Service, Pastor Lito J. L." His letter to me was dated August 28, 1985. <!-black-> "Dear Brother and Sister Rice, Happy greetings in Jesus precious name! We are happy to inform you that one of those who found the tracts sealed inside the bottle you sent out was a resident in the barrio where we are ministering the Word of God. Upon knowing that they had found something inside the sealed bottle, we (my wife and myself) at once went to their residence and had a Bible study for the ones concerned were not believers. God had touched their hearts for they understood the Word and received Christ as their Lord and Savior. Brother, we are so thankful that what you did was of great help to lead those who are still in darkness to God's Kingdom. Hallelujah! Your new brother and sister in Christ, Pastor Andrew C." His letter to us was dated April 5, 1981. <!-black-> "Dear Rev. Rice, Thank you for answering my letter knowing about this bottle ministry. I would love to work with you in this kind of ministry, as I am located on the bank of the Pacific Ocean. In regards to knowing you my father found a bottle. It was a round bottle with the literature and address inside of it. Before this time he was not yet a Christian. So all this news was kept until he became a born again Christian. So I believe what you said-that God has a purpose for those who find a missionary bottle. Thanks for this kind of ministry. I will be working with you. Yours in Christ's works, (Rev.) Dominador T." His letter to me was dated February 19, 1981.Beloved in Christ, Warmest greetings to you in the precious name of our Lord and Savior, Jesus Christ. I am one of your co-workers in the Lord in a far country. However, you may be surprised where I got your address. Last month I met one of the fishermen here and he informed me that he picked up one bottle near his small boat, and he saw inside that there was a small booklet. When he opened it he found out that it was gospel literature. He showed me the Gospel of Luke, and I saw on the back cover that it was floated in 1978. Also this man gave me the address. This bottle floated with the gospel messages from California to the Philippines. Even though the man who found the bottle is a drunkard, I already baptized in water his son and married daughter and his wife last Sunday as they obediently follow the Lord's command. Thank God for the souls who are now coming to Christ. In His Service, Brother Romulo T. M." His letter to me was dated October 30, 1980. <!-black-> "Moronge, April 13, 1980. We found one bottle containing one small book: the Gospel of John, entitled the Water. Also one salvation tract (entitled: On A Passage From) the Gospel of John in English by (T. L. Osborn). The bottle was floated in 1978. H. Lokadi found it on 13 April, 1980, Sunday morning at 10:00 local time (Indonesia). We express our thanks to God, for on that day, we also received the message of salvation which was presented by Mr. T. L. Osborn. With much gratitude, M. W. Manupode." This was one of the few replies I received from Indonesia which is primarily a Moslem nation. (Philippians 1:2). Well, it is very amazing on my part of having the opportunity to know you. Let me explain the story. Three years ago I was befriended by a friend residing near the seashore. We are intimate friends and I got your address from him. According to him he used to go to the sea catching fish. One day he happened to trap a bottle. Your name and address was written inside. I was surprised about this matter. I said to myself there are so many ways and means by which God uses his people to be a blessing to others. I kept on inquiring about the aim and objectives of this matter. It so happened that one minister of God explained it to me and it is here where my heartfelt interest was opened and motivated to accept the Lord Jesus Christ as my personal Savior. Now I have fully surrendered my life to God, which was previously full of sins, iniquities, and vices. I have found a new life. My life has been regenerated by the power of God. I have found real joy and peace with the Lord. I thank God for the miracle he has done to save my life because of you. That bottle crusade as they say motivated me so in accepting the Lord Jesus as my personal Saviour and Redeemer. Now I love and keep that salvation. It did not even end here but I love to serve Him. Yes-indeed! After finishing my degree, God gave my a burden to rescue the perishing souls and I pushed myself to study in Bible School in preparation as a good and successful servant. You have been always a part of my prayers since the moment I have known your name. I owe much to you for my salvation. It is my enthusiastic prayer that God will continuously pour out on you his hundred fold blessings forever. Your brother in Christ, Reynaldo C.C." His letter to me was dated July 29, 1986. It was from the Philippines. <!-black-> "Dear Brethren, I praise God for your wonderful ministry. Because of it one soul came to know the Lord Jesus Christ. A brother found the gospel bottle while he was fishing. He read the gospel tracts from the bottle. By then he was being sowed by the Word of God. It so happened we conducted a crusade in their barrio which is along the seashore. This brother came and accepted the Lord Jesus as his personal saviour and Lord. Thank God for the ministry of sowing and reaping. 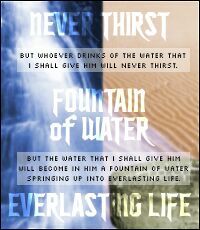 Others sow, water, and reap but God gives the increase. So, I am writing you brethren to inform you that your labor is not in vain. Rejoice and be glad for the fruit of your ministry. Now this brother is actively attending worship services and Bible studies at his very own house which is used as a temporary venue for services. Surely our labor is not in vain in the Lord if we do things for His wonderful Name. God bless you more as you continue doing for His service. Yours in Christ's Name, Ezaldy C., Pastor." His letter to me was dated August 5, 1985 and it was from the Philippines. <!-black-> "Greetings! We have news about one of your bottles! My husband and I are both believers and living in Southern California. We just returned from a month long trip to the Palau Islands in Micronesia (300 miles due east of Mindinao in the Philippines). The day we arrived in one of the outermost villages the bottle was found on the beach by Georginia A. -a little Palauan girl. It had the Gospel of John inside and was brought to us because it was in English. It allowed us the opportunity to explain the gospel- Praise God! I lived in this small village as a child while my father taught English for two years. I had since returned to the United States and accepted Christ, married, and desired to return to see if there was any work being done by missionaries, etc. There is on a neighboring island, but they're extremely short handed so there has never been any exposure to evangelical work in this village. They have had much exposure to Catholicism and their own spirit religion. We now have specific things to pray for them about. Thanks for your ministry- it was one more thing which God used to confirm the rightness of our going. Thank you! Kim and Kim M." A note on the outside of the card indicated that the missionary bottle was launched in 1978 and found September 28, 1980. The card to me was dated October 22, 1980. We give God the glory for all these accomplishments. He is using this ministry as his instrument of evangelism. <!-black-> 1. Realize you are a sinner. You must admit this. <!-black-> 4. Repent of your sins and ask Jesus Christ to come and live in your heart. He will forgive you of your sins, comfort you, come to live in your heart, and give you a new heart." <!-black-> Campaign #2 was launched on November 6, 1981, from the boat named the Lorraine W. We left from Bodega Bay, California and launched 20,000 missionary bottles into the Japanese Current approximately 50 miles from shore. <!-black-> Campaign #3 was launched on November 2, 1982, containing 7,709 missionary bottles. 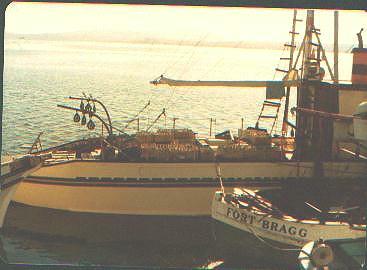 The loading of the Lorraine W. took place at the Sea K Fish Company in Sausalito, California. These missionary bottles were launched approximately 50 miles at sea. There were no "immediate" testimonies in regard to the missionary bottles launched in Campaigns #2 and #3. <!-black-> Here is another testimony sent to us from a girl in the Philippines. One Filipino fisherman, a Mr. Daganio, in Eastern Samar, found a missionary bottle in 1980 that had been launched from Campaign #1. His daughter, Eufrosina, began writing to us. She told us that her father had received the Word of God but refused to repent. Then in another letter she said her father had received a second missionary bottle shortly thereafter but refused to repent again. <!-black-> I immediately sent off a letter to her instructing her to tell her father that he must repent immediately or else some terrible calamity would surely befall him since God had gone to all the trouble to make sure he had found two of the bottles. No sooner had I sent the letter to her than I received one from her, "You know when my father found the bottle, the people in our barrio (village) keep on asking why is it that my father is only the one who found the bottle in the sea. But now my father cannot find any more bottles in the sea because on February 5, 1981, my father went to the sea to catch fish because at that time we had no food and that is why he went. On the sea as my father was catching fish, suddenly there was a very big typhoon. My father was four days in the sea. The boat was destroyed. He kept on praying to our Lord Jesus Christ to save his life. Later on, God answered his prayers and saved the life of my father, but the boat was lost." the letter was dated February 16, 1981. <!-black-> In another letter dated June 20, 1981, she sent me this good news, "Yes, my father became a Christian... I tell you that some people in our barrio became Christians because I gave them the gospel booklets in the Waray dialect. Praise God."